Faith-based partners play a significant role globally and nationally in making a difference in the lives of the world’s most vulnerable children. Communities of faith have been among the greatest advocates for children, providing guidance, aid and comfort to millions of families. UNICEF has a long history of partnering with religious communities of all faiths on a wide range of issues affecting children around the world, helping them survive and thrive. Religious leaders and faith actors have been pivotal in some of UNICEF’s communication and advocacy strategies, given their widely recognized power as agents of change. Today, we see so much conflict and strife, violence, inequity and injustice happening around the world. Even more tragic is that so much is motivated by or perpetrated in the name of religion, which is directly contrary to the ideals, vision, and purpose of the world’s faith traditions. 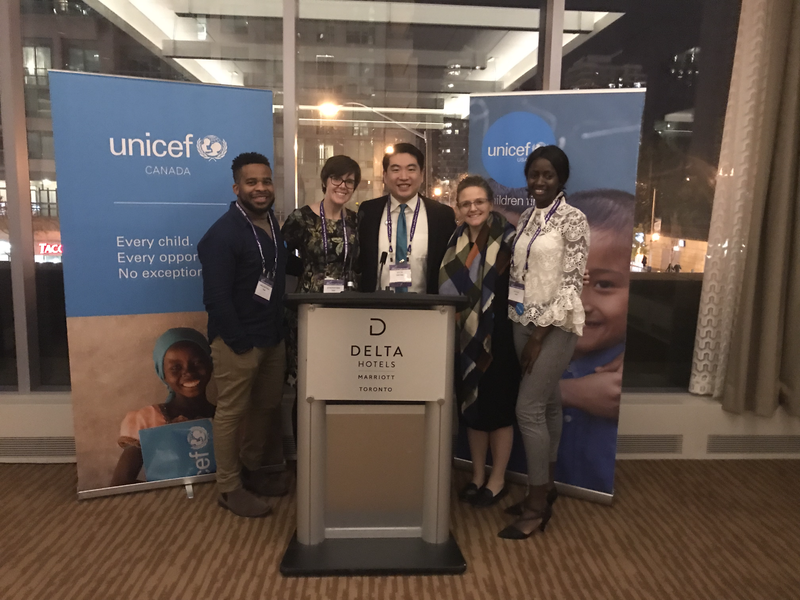 In early November, colleagues from UNICEF USA’s Global Cause Partnerships team and UNICEF Canada, had the honor of attending and participating in the Parliament of the World’s Religions in Toronto, Canada. The Parliament is the world's oldest, largest, most diverse, and inclusive global interfaith event. UNICEF USA hosted a panel session and a networking reception, in addition to an exhibit that provided resources for faith-based leaders and communities. Our panel discussion focused on the impact faith-based communities are making towards global strides for the world’s most vulnerable children. UNICEF USA’s partners for this panel included LDS Charities, Islamic Relief USA, Church World Service and the American Jewish Joint Distribution Committee. At the Parliament, it was clear that our shared commitment to child survival and well-being brought us together. Likewise, many of our partners share the same goals when it comes to working with UNICEF USA despite representing different faiths. As Maurice Bloem, Executive Vice President of Church World Service said, "because we have faith, we speak the same language. 80% of the world considers themselves religious." A fellow attendee at the Parliament mentioned to me that “the true test of religion is its fruits.” For many of our faith partners, their faiths direct them to be compassionate and calls them to action to support those in need. This call to action aligns with UNICEF USA’s mission to aid the most vulnerable children and is a common thread that unites our partners. Through this concept, I think of our how are partners are putting faith into action for children. An example comes to mind that was referenced during the panel. Anwar Khan, CEO of Islamic Relief USA, stated that their humanitarian work is "driven by our faith, funded by our faith, guided by our faith." During the panel, he told a story of how Islamic Relief USA is working together with LDS Charities to send aid to people of different faiths who are suffering from humanitarian crises. This beautiful story is a testament to the power of people of different faith traditions uniting to reach out to help children in need. Not only do we collectively need to rally our communities to action, but we also need to build bridges between and across ourselves, so that none in our global community are left behind in our shared goal to ensure child survival and well-being. Partnership and collaboration are not easy - they take work. As Sharon Eubank, President, LDS Charities and First Counselor, The Church of Jesus Christ of Latter-day Saints Relief Society said, "regardless of doctrine, we care about choice, betterment, inclusion, and we can find common ground." Faith calls our partners to ensure every child has a fair chance to achieve her full potential, while the scale of suffering mandates that we come together to reach the areas and the people that we could not reach alone. For that reason, many choose to partner with UNICEF USA to have global impact for children. As humanitarian crises extend and multiply, the world needs more of its citizens to take an active interest in the welfare of the vulnerable, and especially our children. From the crisis in Yemen, to the plight of the Rohingyas in Bangladesh, to those fleeing conflict in Syria and South Sudan, the immense suffering is unspeakable. For example, the world is in the midst of the largest refugee crisis since World War II. Globally, some 50 million children are on the move, uprooted by conflict, poverty, or climate change. Nearly 250 million children live in countries and areas affected by armed conflict. Meanwhile, every 5 seconds, a child dies from a preventable cause, whether it is lack of access to water, sanitation, proper nutrition, or basic health services. When faced with the sheer scale of these statistics, it can sometimes be difficult to remember that, as Caryl Stern, President and CEO of UNICEF USA said, “behind each statistic is a child, is a name.” But we must all remain committed to putting children first – our future depends on it. As I was walking between events with Will Recant, Assistant Executive Vice President of the American Jewish Joint Distribution Committee, he told me a story of a young boy he met in Sri Lanka after the 2004 tsunami. He asked the boy, "what do you want to be when you grow up?" The boy answered like many his age he wanted to be an astronaut. Perhaps Will saw something different about this boy, because he asked him what his plan for the future was. The boy responded: "I have to do well in school, so I can go to a top university in Colombo. Then I must be a top student in university, so I can get into the Air Force. Then I must do well in the Air Force, so that I can go to America to try out for NASA." Will never found out whether the boy (likely now a young man) was successful in his plans, but he keeps a photograph of the boy on his desk. Like this young boy, every child has a dream. For that boy - like so many other children around the world - natural disasters, climate change, conflict, or poverty, can rob him of his dreams. 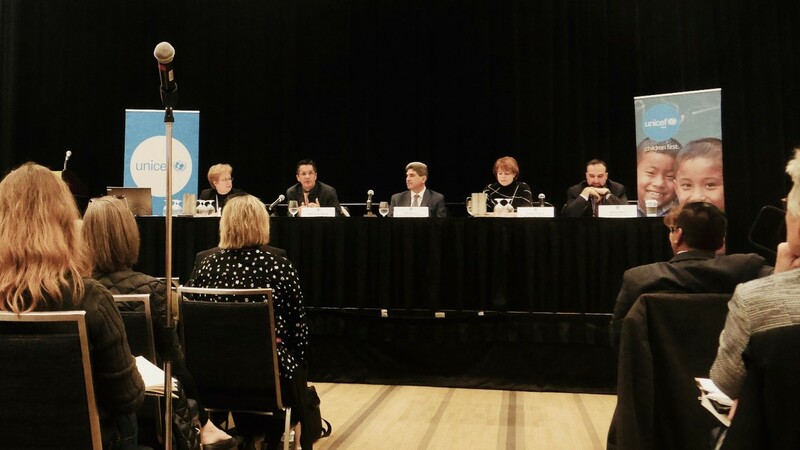 5 November 2018: Maurice Bloem, Executive Vice President, Church World Service addresses the audience during UNICEF USA’s panel on “The Role of Faith-based Organizations in Furthering the SDGs” at the Parliament of the World’s Religions. All lives have equal value and inherent worth, and when faith and community come together we can do even more, especially for children. If you would like to get in touch with us to discuss how we can partner together to make a difference for the world's children, please contact me at achu@unicefusa.org or 212-922-2565.